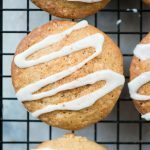 Soft Eggnog cookies with Eggnog Sugar glaze has the amazing flavour of eggnog and melt in the mouth. 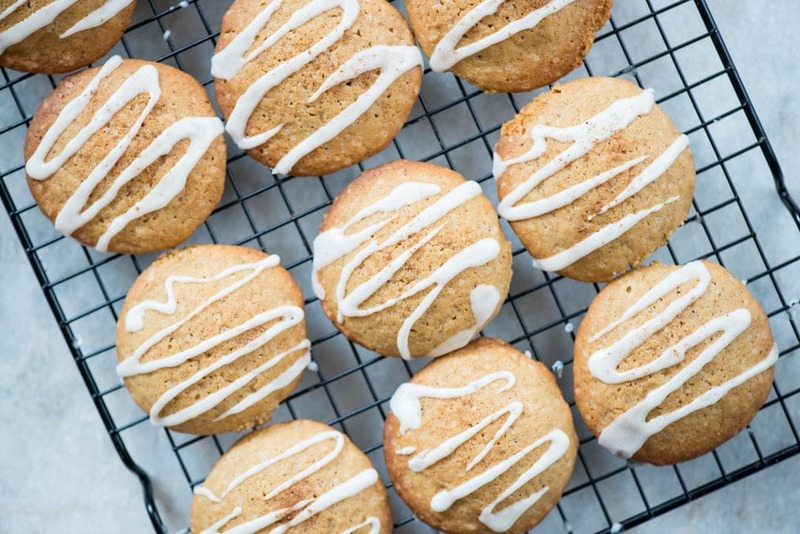 These eggnog cookies are perfect to ring in the holiday season. Love Eggnog??? Creamy rich eggnog without which it is not Christmas for sure. And what if I tell you that you can not only drink eggnog, you can eat it too. 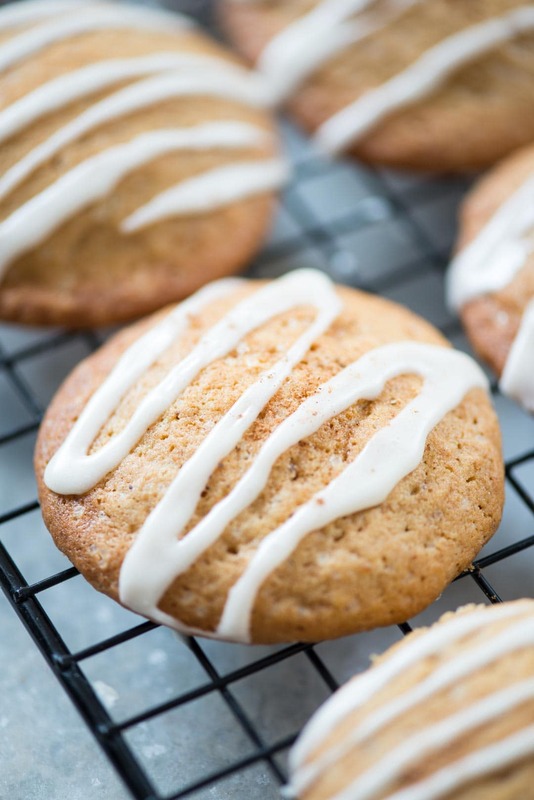 These Eggnog cookies are soft, chewy and are filled with warm winter spices. The eggnog sugar glaze drizzled on top makes it even more irresistible. These cookies are perfect to ring in the holiday season or for Christmas Cookie Swap. The cookie dough has eggnog added to it and then there is eggnog in the sugar glaze too. 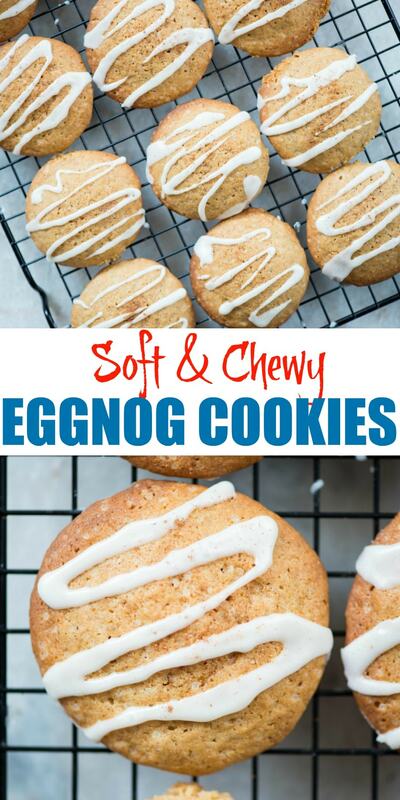 So with each bite of these eggnog cookies, it would feel like you are taking a sip of eggnog. Isn’t that amazing?? I really love the cake-like texture of these eggnog cookies. The edges are slightly crispy. The aroma from nutmeg, cinnamon would fill your house while baking them. These cookies get a rich taste from the eggnog. So make sure you use a good quality full-fat eggnog. 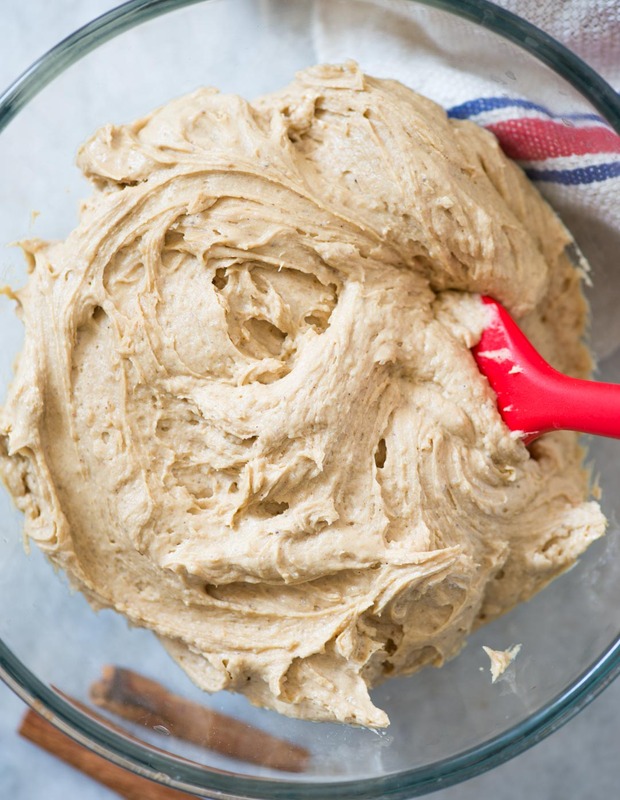 The dough is so good that you can just have a spoonful of it out of the bowl. So you hold on to your temptation. The dough is not as thick as chocolate chip cookies doughs. So it needs to be chilled at least for 30 minutes before baking. It prevents the cookies from spreading too much. Use a small Ice cream scoop to portion the dough. After you scoop out the dough you can let it chill on the cookies tray. Then later freeze them in a ziplock bag. 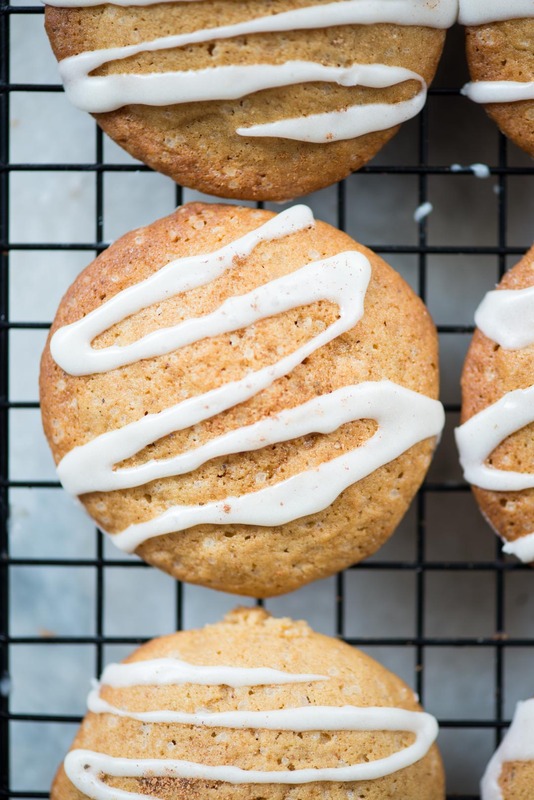 These cookies not only have eggnogs in it, but they are also glazed with Eggnog sugar glaze. Making eggnog sugar glaze is super easy and quick. All you have to do mix icing sugar and eggnog until the desired consistency is reached. THough it is so simple to make, it adds a lot of flavour and texture to it. Then sprinkle more cinnamon or nutmeg on top. In a mixing bowl add all the dry ingredients. Whisk well until everything is well incorporated. Alternatively, you can shift all the ingredients 1-2 times. In another bowl Cream butter, Light Brown Sugar and White, until light and fluffy. Add egg, egg yolk, vanilla Extract. Whisk until incorporated. Scarp the bottom of the pan with a spatula. Now stir in the eggnog. Whisk until everything is mixed well. Now add the dry ingredients in two batches. Mix well until there are no dry patches. Avoid overmixing the dough. Cover the cookie dough with a cling wrap and chill in the refrigerator for at least 30 minutes. Preheat oven at 190 Degree Celcius. Line a cookie tray with parchment paper. 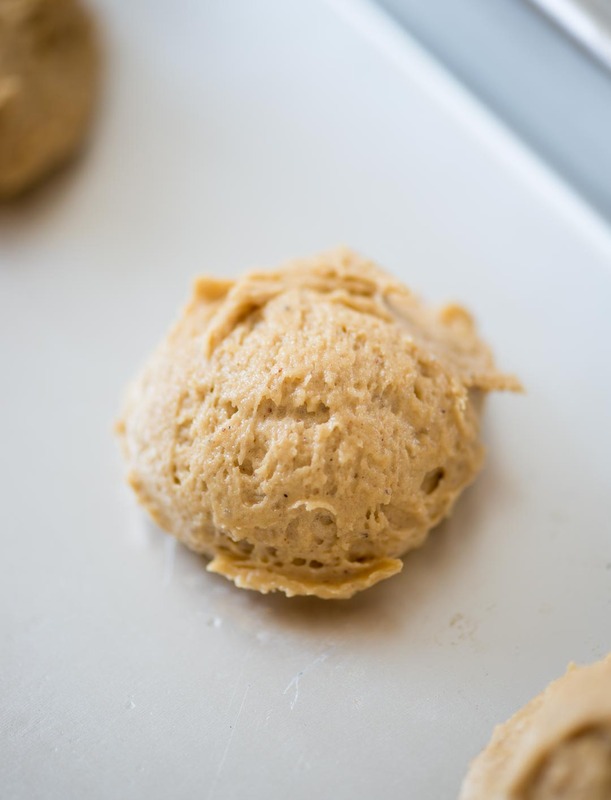 Using a small ice cream scoop, Scoop out portions of Cookies dough and place in the lined tray 2 inches apart( the Cookies spreads while baking). Bake 12-15 minutes in the middle rack of the oven until the top is set and sides are little crispy. Once the cookies are baked. let it rest on the tray for 2-3 minutes. Then transfer to a wired rack. to cool completely. While the cookies are cooling down, Make the eggnog glaze by mixing 1/2 cup icing sugar with 2 tablespoon Eggnog. The consistency should not be too watery. It should form a continuous ribbon when dropped using a spoon. Drizzle eggnog glaze on completely cooled cookies. Sprinkle more nutmeg/Cinnamon on top if desired.